Haisai! 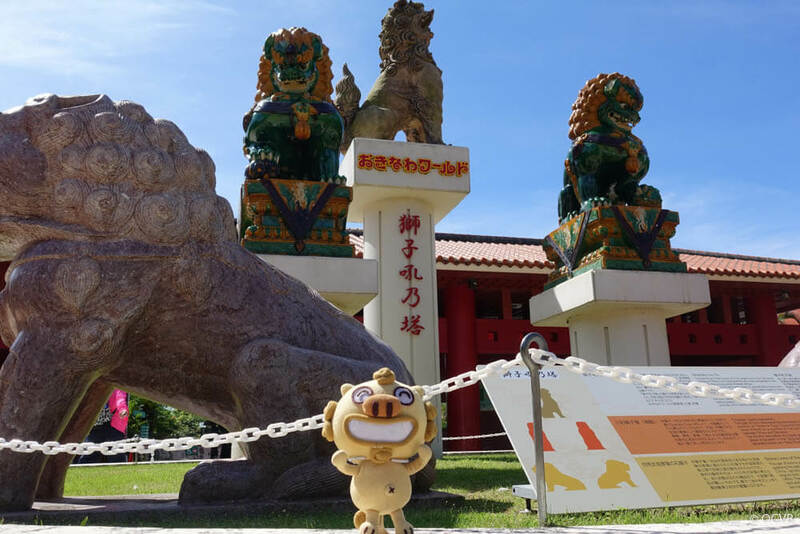 I’m Mahae Chan’s friend, Chim the Shisa. Okinawa World, approximately 30 minutes south of Naha City by car. 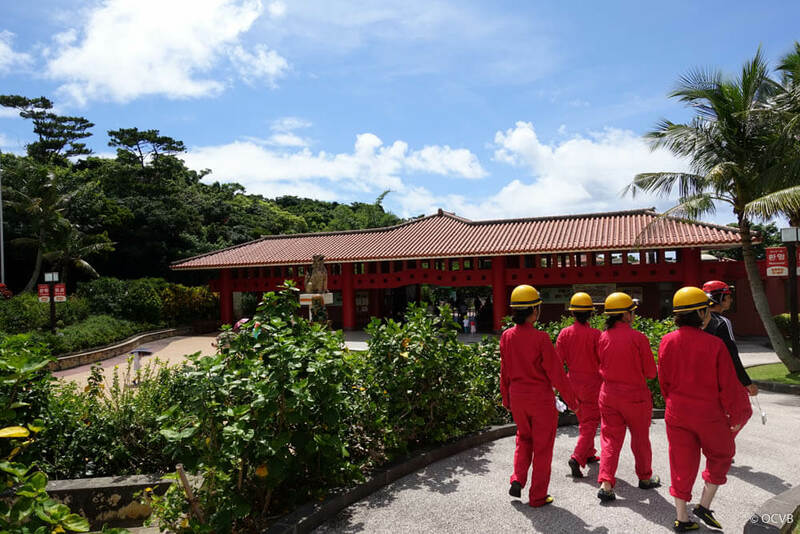 I participated in the summer activity “Explore the caves of the Southern Island” at Okinawa World, a place where visitors can experience the culture and nature found in Okinawa. ※Although the guide could only speak Japanese, there are cards available to use with explanatory notes in English and Traditional Chinese for those who do not understand Japanese. Advance reservation is required to participate on the tour. 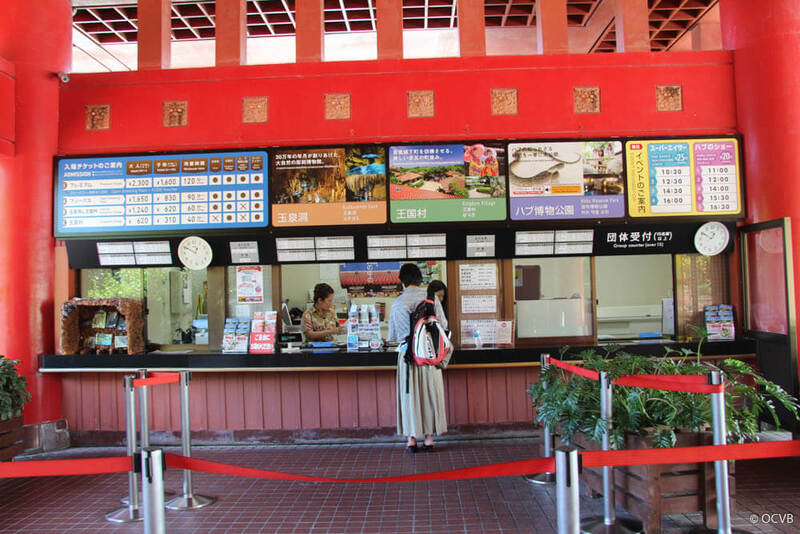 On the day of the tour we gathered at the ticket booth where we were welcomed. The instructor then took us to a gazebo where we got ourselves ready to go caving. ※Coin lockers are charged separately. 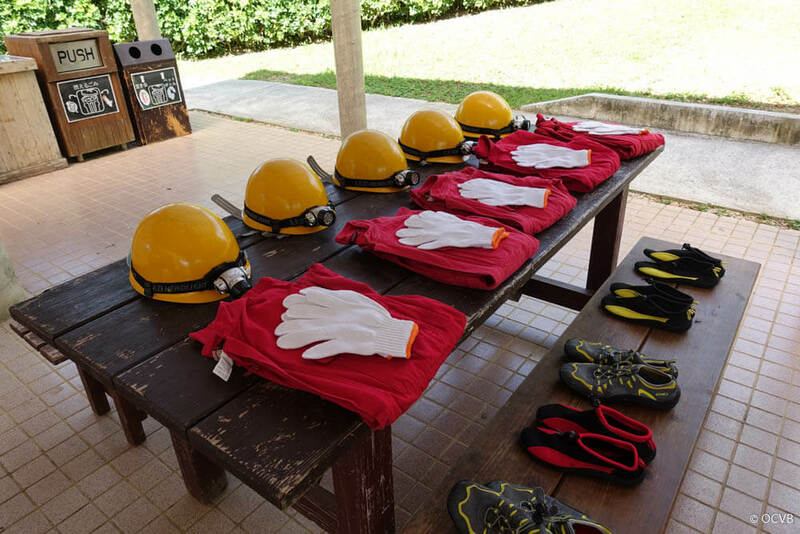 After arriving here, we changed into the clothes provided for us to go caving. ※ There are areas in the cave where the ground is muddy or wet. Participants need clothes that they can get dirty and wet with long sleeves and pants legs, as well as water shoes, gloves, and towels. After changing, we put our belongings into a coin locker. 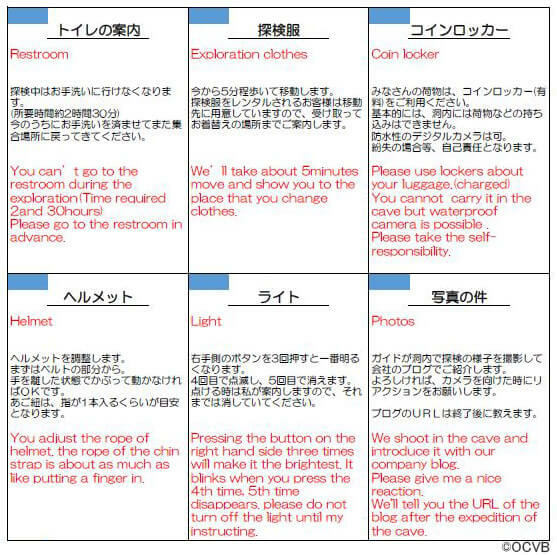 ※ Clothing for caving can also be rented (over suit, gloves, water shoes, towels) but a helmet with headlight is provided free of charge. Please wear a swimsuit or rash guard underneath the over suit. 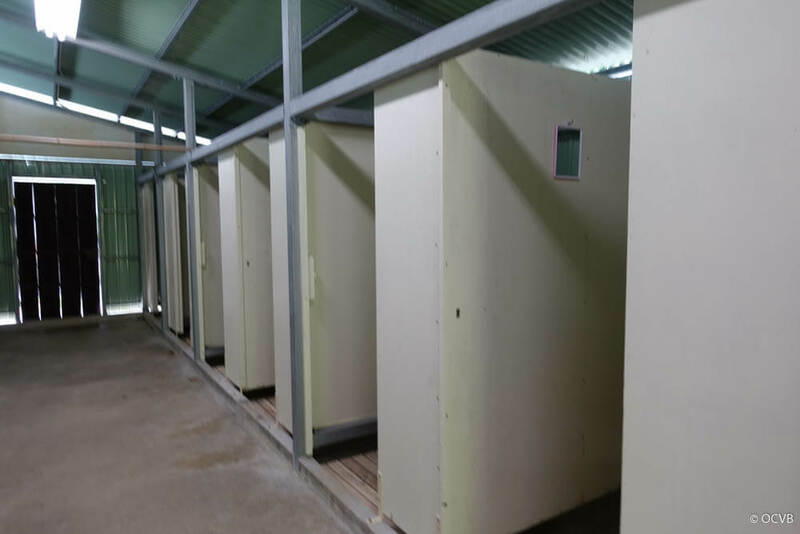 There is also a space to take a shower after the caving expedition has finished and when changing clothes. 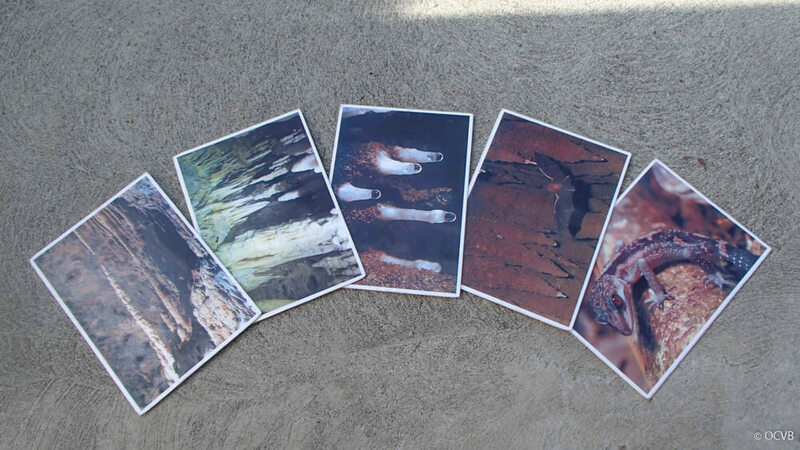 The tour guide uses photos to explain the stalactite structures and living creatures that are found in the cave. There are cards available to read in English and Traditional Chinese for those who do not understand Japanese. After listening to the guide’s explanations, we headed towards the caves. 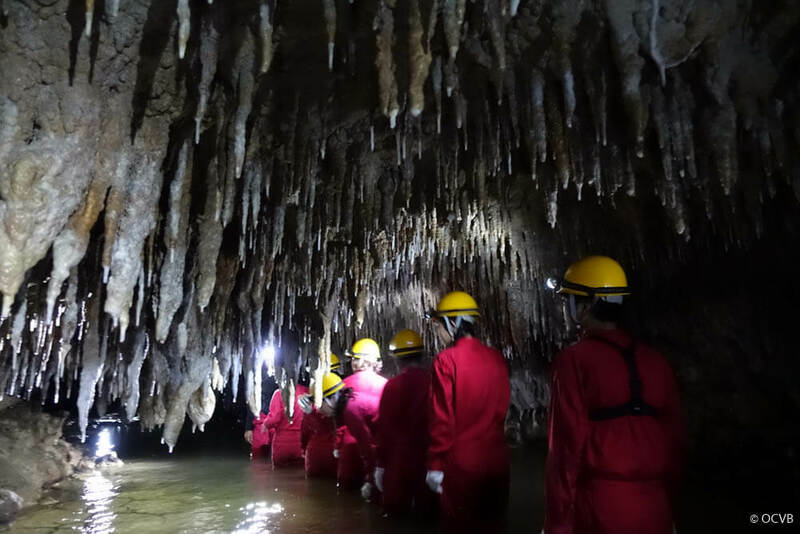 Okinawa World’s limestone cave is the largest in the country, measuring a total of 5000m in length. Currently only 890m is open to the public. 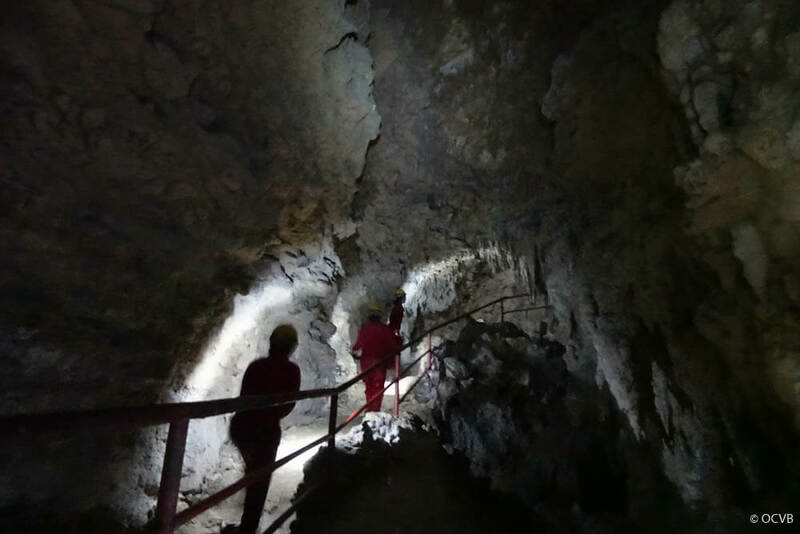 During the cave exploration, participants can see some of the areas that are closed off to the public. The inside is lit up and it is incredibly beautiful. The temperature stays at 21℃ all year round. You could look and wonder around in just this area of the cave, but let’s take a side path and explore some more! 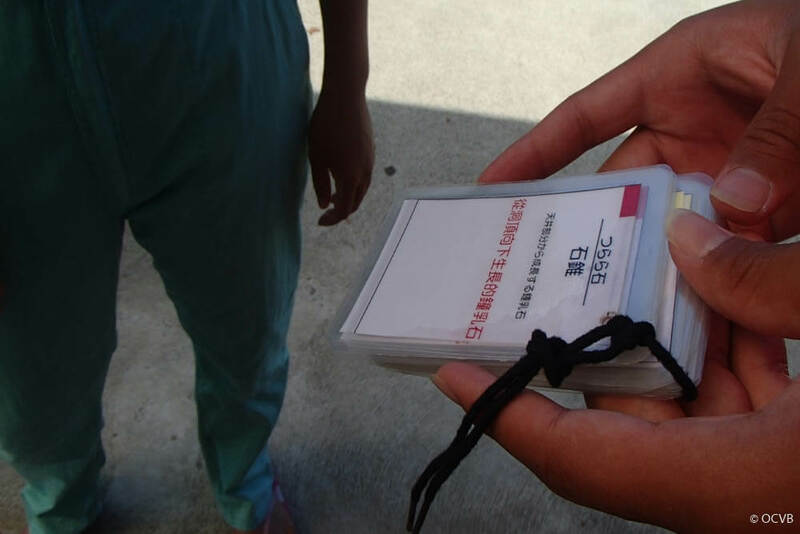 The tour is also safe for foreigners, as the instructor uses explanation cards in English and Traditional Chinese. 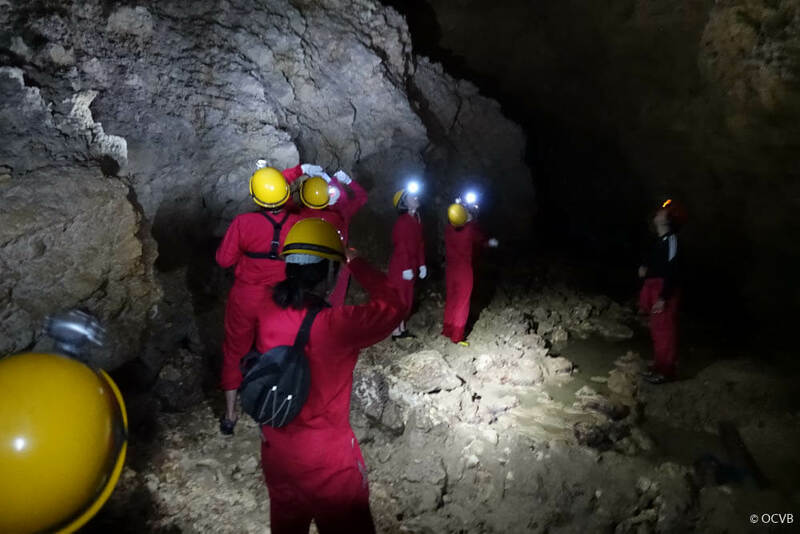 While exploring the caves, there are areas where you cannot bend over or where you cannot go forward and the helmet and headlight are extremely useful. After walking a short while, we reached an open area. Here we were told about the stalactite. 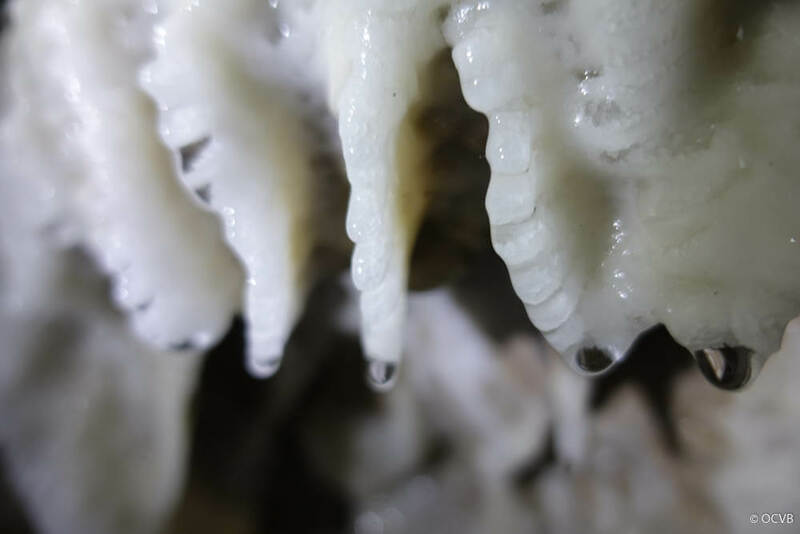 Stalactites are layers of limestone which have hardened and are shaped like icicles, giving them the name “stone icicles.” From these stone icicles, water droplets fall to the floor to create “stalagmites,” which grow from the ground upwards. It takes approximately 30 years for stalactites to grow 1cm in the Gyokusendo Caves. 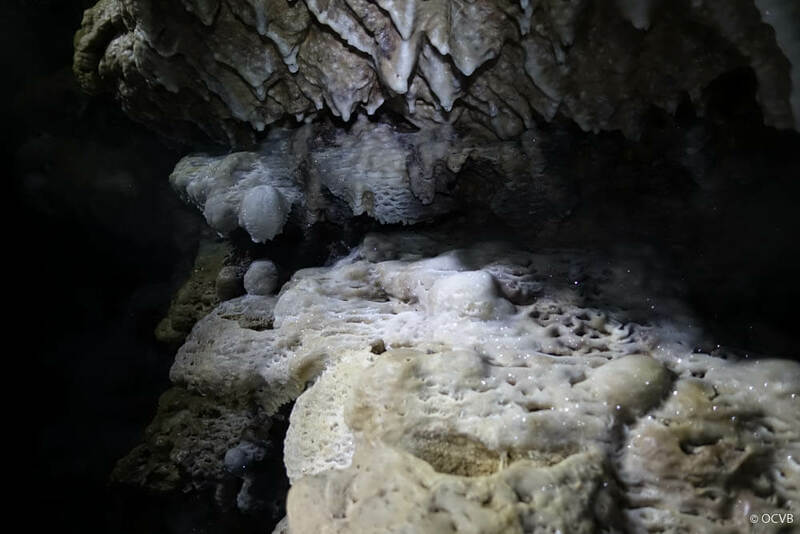 The smaller stalactites shown in the photographs have taken hundreds of years to grow, while the larger ones have taken tens of thousands of years. 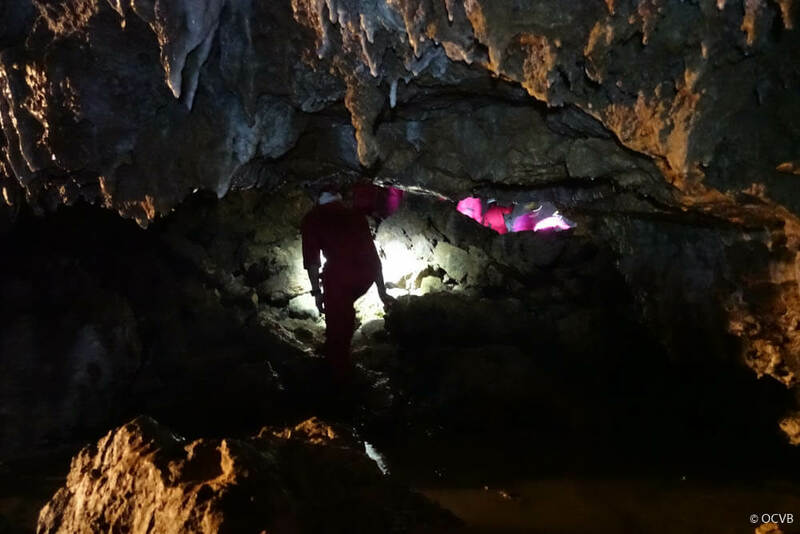 As is clear from the explanation of stalactites, the water level rises the further you go into the cave. During our exploration, we headed along a path of water. As we headed further along, the amount of water increased and in some parts it was 1m deep. While exploring the cave, I found an unusual stalactite. Several hundred years ago, a group of icicle stones had fallen from the cave roof and new stalactites are now growing from where they fell. 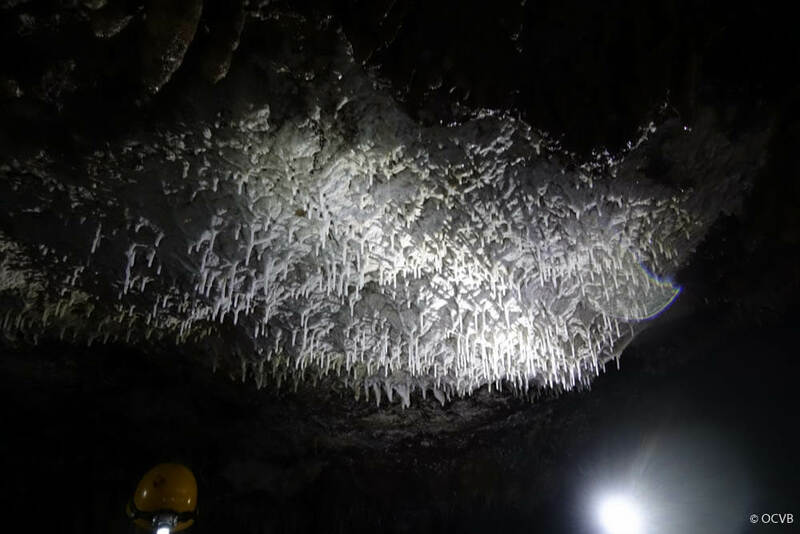 As the caving expedition finally comes to an end, there are beautiful stalactites ton both sides of the passageway. This is known as “cave bacon” and is a thin, curtain-like stalactite that grows with flowing water. Stalactites known as “flowstones” reflect the light when it hits them and they sparkle beautifully. 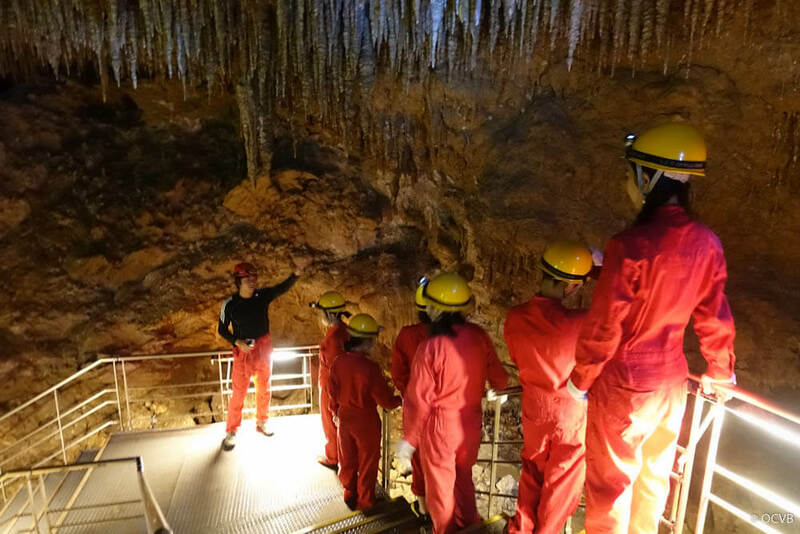 After seeing these mysterious stalactites, we return to the surface from 40m underground. 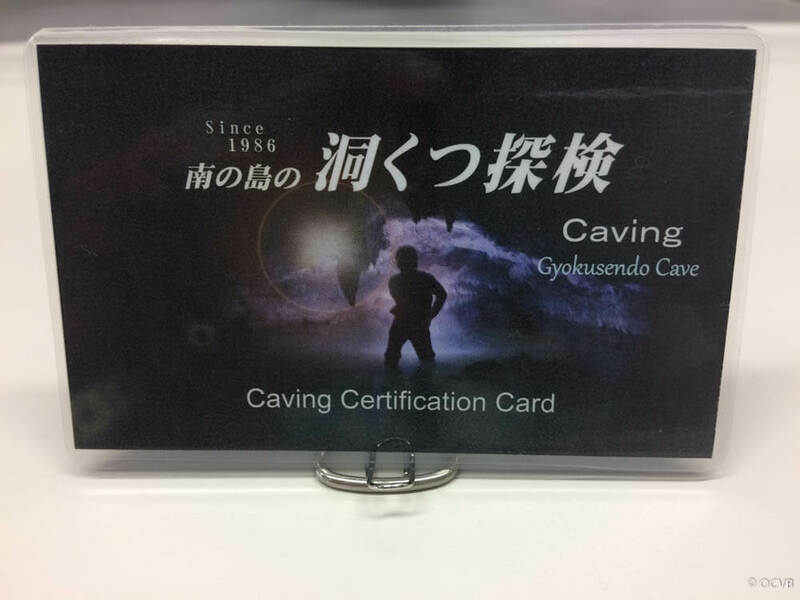 Once the cave expedition has finished, everyone receives a caving certificate! 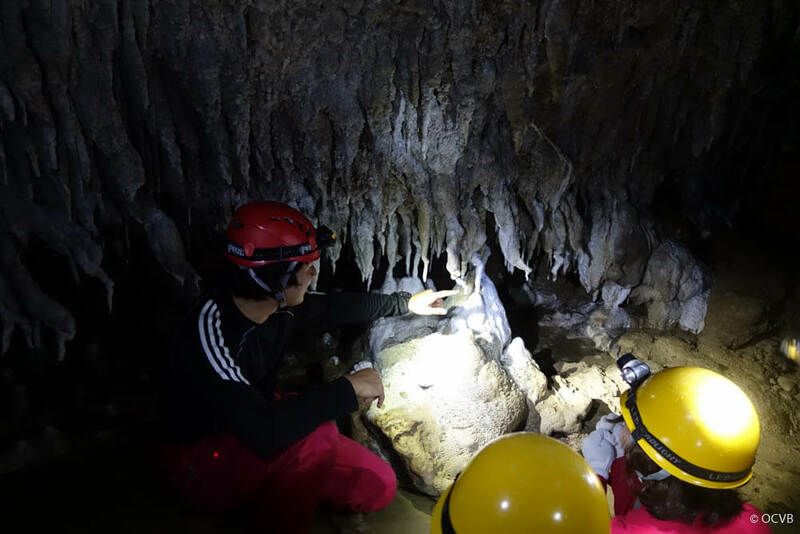 Why not try caving during your summer in Okinawa?